When opening a practice, doctors and their staff need to consider the all the levels on which they provide patient care. For instance, you must maintain a calming and peaceful environment, one which is free from germs, with durable surfaces and easy-to-maintain components. Clean, safe, and durable floors are critical for success in your doctor’s office. Request a consultation for floor coating services near Edgewood, Maryland today. We also service the Mid-Atlantic region of Maryland, Virginia, Pennsylvania, and Delaware. Can a New Floor Coating Improve the Patient Experience? The answer is yes. While most patients expect a doctor’s office to be clean and sterile, a cold, laboratory-like office can increase a patient’s anxiety. Stainless steel tables and institutional flooring are easy to keep germ and bacteria-free but are cold and impersonal in appearance. In seeking a softer ambiance, you can’t afford to overlook the maintainability of the sterile and germ-free environment, but you shouldn’t forget the patient experience, either. Investing in brighter, warmer colors for your doctor’s office floors can help to shape a more positive and inviting experience for your patients. Talk to us about floor coating services for your doctor’s office today! Based in Edgewood, Maryland, we service the local areas of Maryland, Virginia, Pennsylvania, or Delaware! Prestige Floor Coating specializes in finding the right floor coating for your home or commercial business, including healthcare facilities and doctor’s offices. Our floor coatings are uniquely tailored to fit your needs. Not only are our floor coatings built to last and earth-friendly throughout their production phase, they also emit absolutely no VOC’s, meaning nothing to irritate those sensitive to air quality. For more information about floor painting or floor coating services in Edgewood, Maryland, or nearby, contact us today! Your fast-paced doctor’s office is likely pretty busy! Quick-stepping personnel and patients will appreciate the anti-skid properties of our floor coatings for doctor’s offices, so even the busiest days won’t hinder staff or patient safety due to slips or poor flooring conditions. Slip and fall injuries can be detrimental to your patients, staff, and associates, and are often the center of lawsuits in medical care facilities. Investing in quality floor painting or coating services can have a dramatic and positive impact on the way yourself and others move about within your facility. Request a consultation for floor coating or floor painting services today! 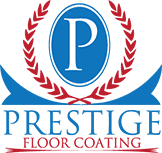 For over 22 years, Prestige Floor Coating has been the industry leader in protective coatings for concrete floors. More than 2 million square feet of residential and commercial floors have had our floor coating installed with very happy results. Our floor coatings are unaffected by liquid, caustic chemicals, and heavy machinery. This superior product is stain resistant, UV protected from fading and degradation, and up to 800% stronger than concrete flooring. The elastic, rubberized membrane is comfortable and easy on your feet-especially when you’ve been on them all day. You and your staff will surely benefit from that advantage. Our high-quality floor coatings for doctor’s offices are available in a vast array of colors to add some panache to your exam rooms. Prestige Floor Coatings installation team can install your floor coating in a few days’ time, with little interruption to your practice. For quality floor coatings for doctor’s offices, or any healthcare facilities in and around Maryland, trust Prestige Floor Coatings. We’ll have your floors installed on time and on budget. Your satisfaction is our number one priority. Prestige Floor Coating offers high-quality floor coating and floor painting services throughout the areas of Maryland, Virginia, Pennsylvania, and Delaware.